I am not a beer drinker. So I hesitate when my husband asks if I want to go to the beer-centric Meridian Pint, because he needs to stop in for work-related purposes. I quickly scan the menu, beginning with appetizers. Chili, deviled eggs, mac and cheese. I am not enticed. As I get farther down the page it gets much more interesting: goat cheese risotto cakes, shrimp and tofu skewers, ceviche with shrimp. Meridian Pint is self-described as a neighborhood gathering place. My husband and I are clearly not the target audience. It’s much more geared to my son who actually lives in nearby Mt. Pleasant. But as I peruse the website I am impressed by the commitment to sustainability. Meridian Pint was founded on the premise of environmental sustainability. Our strict focus on American craft beer allows us to eliminate the impact of Trans Atlantic shipping as well as maintain a locally based revenue stream. In addition, we serve mostly draft beer enabling us to reduce our impact on recycling resources. ‘Envirelation’, DC’s first and only composting company, has been hired on to compost the bulk of our waste and reduce our impact on landfills to less than 10%. Furthermore, much of the equipment, furniture, construction materials and design elements have been recycled or reclaimed. Our energy source comes from wind mill farms in the way of green energy credits. Finally, 95% of our staff lives within walking distance helping to minimize parking problems, traffic flow and overall reduce our carbon foot print. Still, I’m not exactly eager to drive downtown on a rainy Saturday night to a restaurant that is not really on my radar. But being the dutiful wife that I am, particularly when it comes to restaurants (insert sarcasm here), off we go. When we arrive at 7:00 pm on a Saturday night, Meridian Pint is packed. I am surprised at the spacious digs and the vibrant energy even though it is still early. We raise the average age somewhat, but on the other hand we are not uncomfortably alone in terms of demographics. There is a 25 minute wait unless we want to sit at the communal table near the bar. Communal table it is. My drink of choice is a pint of Jack’s hard cider with Hauser Granny Smith apples. This is as close to beer as I am going to get. I like it…a lot. 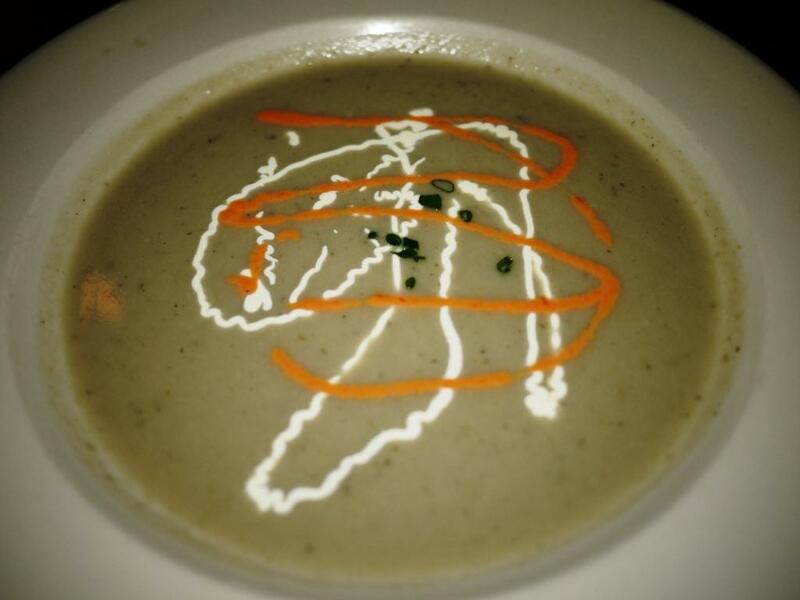 We share a soup special: cool eggplant with red pepper coulis and fennel cream. The soup is a refreshing start to the meal, but I find the flavor a little too subtle. I’m thinking that a touch more of the coulis would have kicked it up just a notch. 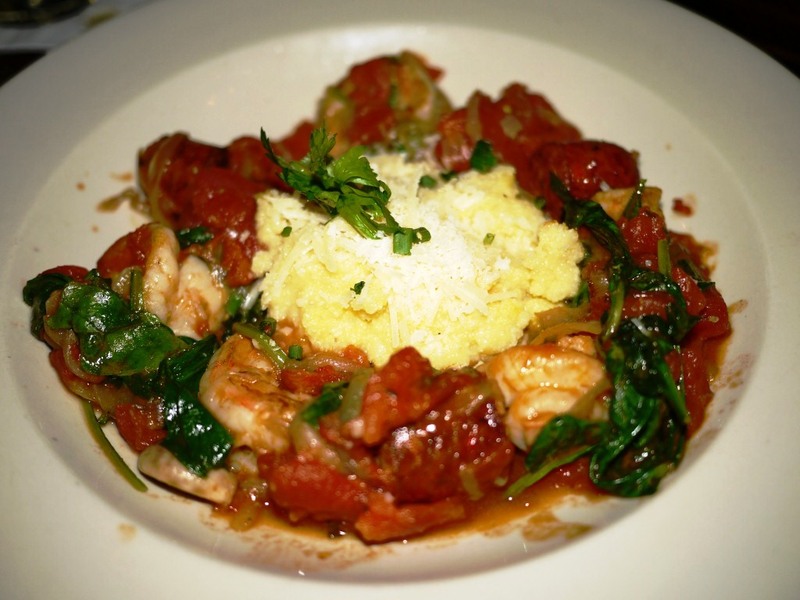 My entree is Marvestra shrimp and Stachowski chicken chorizo sauteed with stewed tomatoes and spinach over soft polenta. The local, organic shrimp are some of the tastiest I’ve ever had, and cooked just right. Likewise for the chicken chorizo, which has a nice bite in terms of texture and taste. The tomatoes and spinach are a lovely accompaniment to showcase the fresh main ingredients. I savor every bite. I am now really liking this place. The vegetarian-friendly menu has multiple intriguing options, including lentil burgers to replace meat in any of the hamburgers. My husband has the Buffalo burger made from lentils and barley, along with an order of roasted sweet potato wedges. 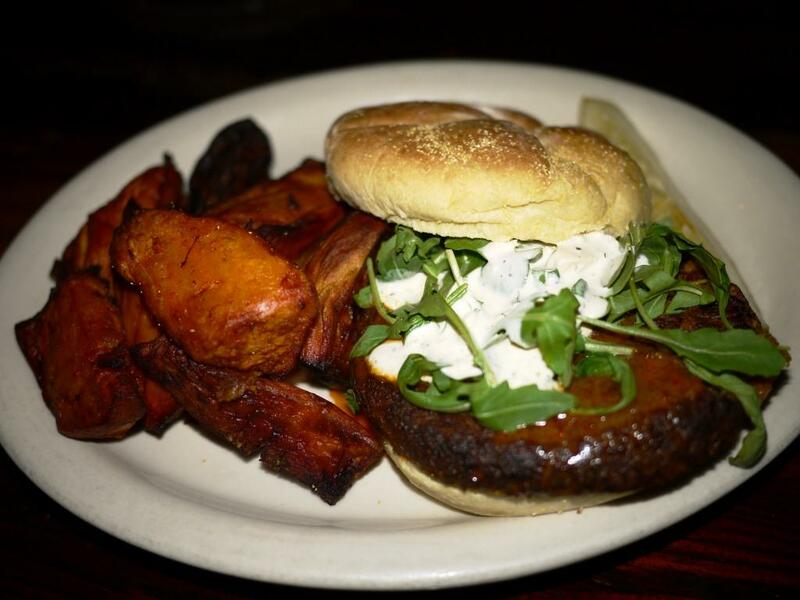 The burger, coated in buffalo sauce and topped with bleu cheese dressing and arugula is enough to satisfy any reformed carnivore. For once he doesn’t feel like he’s merely enduring a substitute for beef. He genuinely enjoys this burger, and the potato wedges add just the right amount of sweet. It’s satisfying when an outing that starts out with hesitation and reluctance has a happy ending. In some respects it can be better than going somewhere with high expectations, because there is an element of surprise. Clearly Meridian Pint is a destination for some interesting locally-brewed liquid libations. It should be noted that they are also brewing up some very solid food. I want to thank you for taking the time to not only visit Meridian Pint but to also share your experience. We take great pride in what we do and how we do it and it is certainly nice to be recognized for it from time to time. I hope we will see you again sometime.